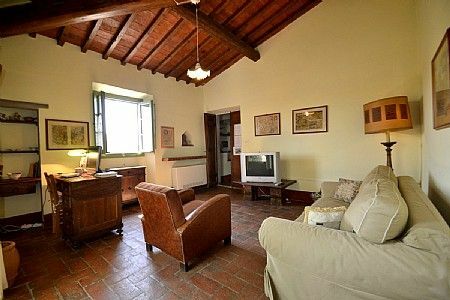 this property is a cozy and welcoming apartment that is part of a Tuscan farm property. It sleeps four people. From this property you will enjoy a charming view of the valley. this property is 60 square meters (645 square feet). It features a private garden, air conditioning (please read description below to check in which rooms the units are installed), winter heating and WI-FI Internet access. You will be roughly 2 km (1.2 miles) from Grassina, where you will find restaurants and a grocery store. You will reach this property from the parking area going up a walkway that includes approximately 22 stairway steps. this property is one of three apartments, part of a Tuscan farmhouse. The other two apartments in the structure are the private residences of the owner. The garden is 150 square meters (1615 square feet) large. It is partly shaded by trees. It is equipped with a table, chairs, a wooden gazebo and an external shower. The gazebo can be used only in the summer months from the beginning of May to the end of September. Here you will also find a portable barbecue. From the garden you will enjoy a gorgeous view of the valley and of the olive grove. The living room is paved with stone tiles. The ceiling is sloped and has characteristic exposed wood beams. The furnishings are simple and comfortable. The furnishings include a divan that unfolds into a double bed and a desk. In this room you will find a satellite television (local channels) and a personal computer. From the living room you will be able to enter the external stairway through a French door. The room also has a window with a view of the greenery and of the valley. It is equipped with an air conditioning/heating unit. You will be able to enter the kitchen from the living room. The ceiling of the kitchen has characteristic exposed wood beams. It is equipped with a five-burner gas cooker, an electric oven, a small refrigerator with freezer, a dishwasher and an Italian-style coffee-maker. Here you will also find a washing machine (hidden by a curtain), an iron and an ironing board. There is a table to seat four guests. The kitchen has a window which overlooks the back of the house. You will be able to enter the bedroom from the living room. The bedroom has a matrimonial bed (160 cm/62 inches, wider than a queen-size bed). From the bedroom you will be able to enter the external stairway through a French door. The bedroom is equipped with an air conditioning/heating unit. The bathroom is equipped with a washbasin, a toilet, a bathtub with shower wand and a hairdryer. The bathroom has a small window which overlooks the back of the house. You will be able to enter the bathroom from the living room through an access area. This house, in Galluzzo, boasts a gorgeous valley view sleeping 4 people. The house offers superb accommodation, including modern luxuries such as internet access, air conditioning and a television. You can bask under the Italian sun in the house’s beautiful garden, making use of its great facilities.